Brigade is one of the flagship titles of the Image Comics series. 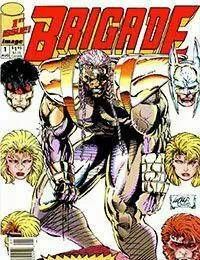 This series, created by Rob Liefeld, features a team of super-heroes spun off from another Image hit, Youngblood.<br />Brigade is a team of super-heroes funded by two wealthy brothers, Coldsnap and Seahawk, who take an active part in their investment. Battlestone, formerly the leader of the Youngblood team, heads Brigade. Atlas, a giant; Kayo, an archer; and two women: Thermal, who can throw fire, and Stasis, who can create anti-motion force fields, round out the team. Not sanctioned by the government, these vigilantes nevertheless manage to find situations which challenge their skills and teamwork.